Project Smoke is the How to Grill of smoking, both a complete step-by-step guide to mastering the gear and techniques and a collection of 100 explosively flavorful recipes for smoking every kind of food, from starters to desserts. 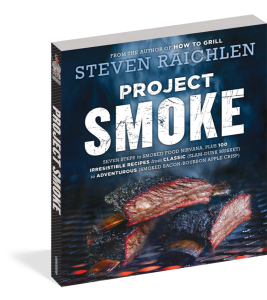 Project Smoke describes Raichlen’s seven steps to smoked food nirvana, including 1. Choose Your Smoker; 4. Source Your Fuel; 7. Know When Your Food Is Done. There’s an in-depth rundown on various smokers; the essential brines, rubs, marinades, and barbecue sauces; and a complete exposition of woods: and ways to smoke—cold smoking, hot smoking, smoke-roasting and smoke-braising. Then the recipes, all big-flavored dishes. Bacon-Crab Poppers. Cherry-Glazed Baby Back Ribs. Slam-Dunk Brisket, Porkstrami, and Jamaican Jerk Chicken. Even desserts and cocktails—Smoked Chocolate Bread Pudding or a Mezcalini, anyone? Illustrated throughout with gorgeous full-color photographs, it’s a book that inspires hunger at every glance, and satisfies with every recipe tried.